As name suggests "AE - Post Title" widget allows you to show Post Title. It comes with various options related to html markup and style. Post Link: Choose whether to link Post Title with post's permalink or not. Tip: Link will be useful when designing archive page layout and layout for Post Block Widget. For single post layouts it is not recommended to put link on post title. Alignment: Choose alignment for post title. This options also allows too choose different options for devices giving you more responsive control. You can also use lot of styling options available under style tab. 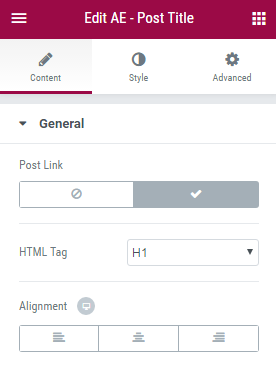 Tip: Disable Post Link while using this widget for Single Post layout. It doesn't make any sense in have link to same page on your post title.